Speed up your career growth! Take a English course for professionals in Philippines and make your next career move faster. These English language courses for executives, directors and young proffessionals are specialy design for all levels in the language, groups or individuals. 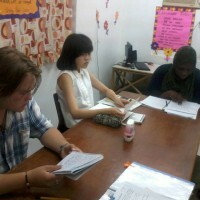 Learning English in Philippines will expand your career horizons, this is especially relevant in today's global market. Our English courses for professionals in Philippines will enable you to speak the English language and open you doors to other markets and jobs. Being able to speak the English language proficiently will open you doors to more opportunities.